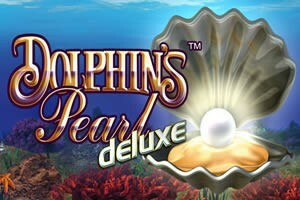 One of the most popular of the Novomatic slot games is the Dolphin’s Pearl whose original, classical version has been a huge success throughout Europe. The game has been appearing at the brick and mortar casinos of Europe and Australia for years. If this game isn’t already appearing in Las Vegas, it will very soon, in a matter of weeks to be exact. Due to the great popularity of the classical version, it is no wonder that the online, deluxe version would be launched. The launching of the deluxe version took place on May 6th, 2008. It is now gradually replacing the old version and can be played in both offline and online casinos. The two versions are basically the same in game playing and rules. However, the deluxe, video version has one more payline as well as updated bright and colorful 3D graphics. How about taking a dive into the sea? Don’t worry, you don’t need a diving suit for this diving trip. All you need is a little imagination. 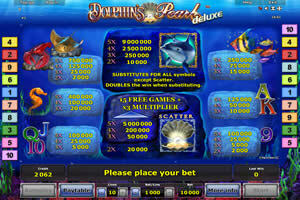 Playing the deluxe Dolphin’s Pearl Slot Game is like entering the environment of the sea where the action takes place and you run across all sea-related things. You will see sea-related things that are the symbols of the game such as stingrays, lobsters, seahorses, rainbow fish, oysters, green algae, rare exotic fish, and, of course, the dolphin. At the bottom of the sea sits an incredible pearl. 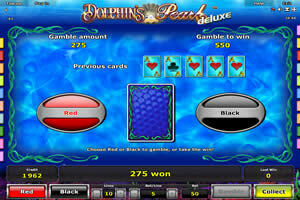 Besides the sea-related things, you will encounter the playing card symbols that include A, K, Q, J, 9 and 10.The online, Dolphins Pearl deluxe version has five reels and offers ten paylines. For a win, you must manage to get between two and five identically matching symbols across a line on the reels. To create a winning combination on Dolphins Pearl Deluxe, you need a minimum of three identically matching symbols except for the lobster or oyster symbols. With the lobster and oyster, you need only two exact matches for a win. The adorable sea creatures of this game coming to life and beginning to do a little dance means you have just created a winning combination. This is a feature of the game that you will love due to its adding to the playing fun. The dolphin is a Wild symbol. As with most slot games, the Wild symbol can substitute for any other symbol to create a winning combination. Therefore, the dolphin can substitute for any of the other sea symbols to create a winning combination. For a win of a special bonus in Dolphins Pearl Deluxe, three or more of the oyster with a pearl in it symbols can appear anywhere on the screen. This is because the pearl-oyster is the game’s Scatter symbol. The usual special bonus is fifteen free spins or bonus rounds with a x3 bet multiplier. In addition, there is basically no limit to the number of free bonus spins you can get since the bonus spin can be re-triggered. 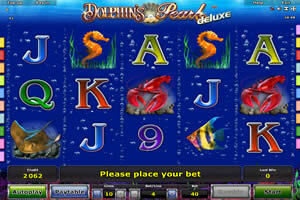 Getting a winning combination with one or more Wild dolphin symbols doubles your winnings. It is important to note that the dolphin Wild symbol can’t substitute for the pearl-oyster Scatter symbol. When you play for real money, getting five dolphins in a line and the bet spin has been optimized to a maximum value the payout will be 90,000 coins. Additionally, any winning combination gotten with a Wild Symbol will have a 2X multiplier applied. All of these magnificent features are why so many Australian players consider this game one of the best online pokies. The Gamble feature is another reason you will really like this game. If you are able to correctly predict whether the next card drawn from a virtual deck is either red or black, your winnings will be doubled. Therefore, you would have a 50% chance to double your winnings, but you will also have a 50% chance to loose. The deep sea theme, the fantastic fun of playing and the spectacular bonus features make this one of the best online video slots of today. Whether you play for free at one of the many sites that offer free play of this game or you play for real money, playing Dolphin’s Pearl will definitely be an adventure filled with enthralling fun.